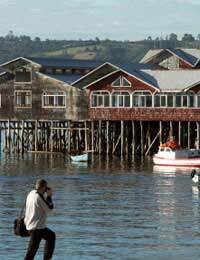 Chile is a Spanish-speaking country located in the most southern aspect of South America. Chileans are extremely family-orientated people and a person will often be judged on their class, family and education. This is partly due to the fact that Chile has gained notoriety for its impressive literacy rates, something that Chileans are very proud of. They love to talk about their country to foreigners, and you may find that they are very keen to learn about yours. When introductions are made, it is best to retain a reserved approach at first. Chileans are very hospitable and friendly people, but do respect formalities. If addressing someone, and if it is known to you, you must always use their title and paternal surname. As with other Spanish-speaking nations, Chileans have two surnames, one of which is paternal and the other maternal. The paternal surname is written and spoken first. When addressing a Chilean you will only need to use the paternal surname. If you are not aware of a person having a specific title, then it is best to just refer to them as ‘Senor’ for a man and ‘Senora’ for a woman, followed by their paternal surname. Informalities are usually quickly established once the introductions have been made, but a Chilean should only initiate this. If you happen to be on well-established friendly terms with older people, it is more common to use the phrases ‘don’ or ‘dona’ followed by their first name. Again, this should only be initiated by your Chilean counterpart, moving to informalities too soon could be regarded as deeply disrespectful and very bad etiquette. When greeting in Chile, men should shake hands with each other and women should either shake hands, or kiss once on the right cheek. The most senior member present should always be greeted first. It is also common for women to lightly pat each other on the right shoulder or arm. If you are planning on giving a gift to a Chilean, you should be aware that certain colours and gifts carrying their own symbolism. Black and purple are regarded as the colours of mourning and death. Also, giving a gift of scissors or knives, as with other Latin American countries, is seen as a symbol of the severing a relationship. Yellow roses are also commonly thought to be a sign of disrespect and disdain, so should be avoided at all costs! The best gifts to give are wine or chocolates – remember that Chile is a wine-producing country, so always select a high-quality wine. You should expect your gifts to be opened in your presence. Also take into account that if you want to send flowers, you should make arrangements for them to arrive prior to your visit. Chileans have a tendency to stand relatively close to each other when they are talking. Although you might find that this is perhaps a little too close for your liking, you should just accept that this is normal behaviour in Chile, and trying to create more space between you and your Chilean counterpart could be seen as rude. Whilst in Chile, you may come across a gesture of a flicking motion under the chin. This is meant to indicate that the person does not care and is apathetic, although some Chileans regard this as quite crude and a sign of lack of good education. Clicking your fingers at someone is also seen to be bad etiquette, as is making a fist with your right hand and hitting your left palm. A foreigner should not use any of these gestures. Chile is principally a Roman Catholic country, and as such much of the morals and beliefs that shape the political structure of the country adhere to their faith. Chileans are readily open to political discussion, but you should be mindful of a few points. Take into consideration that the dictatorship of Pinochet is still very much in living memory and may prove an extremely sensitive topic to some. Many suffered and lost their lives during his rule, and it is perhaps good etiquette to only broach this subject if brought up by a Chilean in discussion. Although Chile remains a somewhat patriarchal society, it is actually quite progressive in terms of its gender equality. Mothers are seen as vitally important members of society, and will often have a final say on issues and decision-making within families. Women make up a sizeable proportion of the workforce, retaining many important bureaucratic positions. But as a woman travelling in Chile, do not be offended if you are frequently gazed upon -it is merely meant as flattery and a sign of admiration! Also, it is good etiquette to always let a man foot the bill when dining out in Chile. To refuse or try and pay half could be seen as emasculating for the man in question.